On Friday 24th June our Zephyrus residential scheme won the 'Best Unbuilt Scheme Award' from the Jersey Architecture Commission. In 2008 we were commissioned by the Waterfront Enterprise Board (WEB) to work up designs for a new residential development on land known as the Zephyrus Site. The site is located on the waterfront and has been developed in compliance with the principles of our Esplanade Quarter masterplan that was adopted formally by the States of Jersey in June 2008. The scheme proposes a mix of flats ranging from 500 sq ft one bed units up to 2,500 sq ft four bedroom apartments, with the five apartment blocks arranged to benefit from sea views across St Aubin's Bay. Penthouse apartments have roof gardens with glazed reading rooms and the remaining flats share a private garden at ground level. Active uses are proposed for the ground floor ranging from nursery use through to a residents' gym. A basement underneath the entire site provides parking for 87 cars, storage areas for flats and the building's principal plant areas. The construction utilises concrete flat slabs spanning from a central core to a perimeter structural frame of high quality white precast concrete.The full-height glazed facades variously give onto balconies, or are themselves pulled through the frame to form bays, maximising enjoyment of the excellent views towards Elizabeth Castle, along the waterfront, and eastward along the proposed Esplanade boulevard to the Weighbridge. Between the blocks privacy becomes a consideration, and the bays become solid panelled protruding pods that accommodate bathrooms and bedroom storage, flanked by strip windows. The facades of the penthouses are set back behind continuous balconies, with their tapering roofs over-sailing to visually cap the expressed frame. 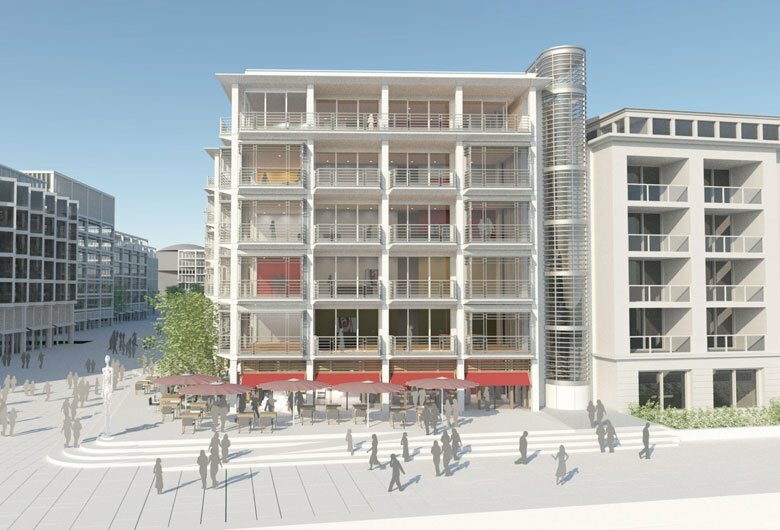 The development will provide a new residential quarter and public piazza, which will become very much a part of St Helier - a space for all islanders and visitors to enjoy. Full planning consent has been obtained for the whole development and the design has been progressed to Tender stage. The project is expected to start on site next year.